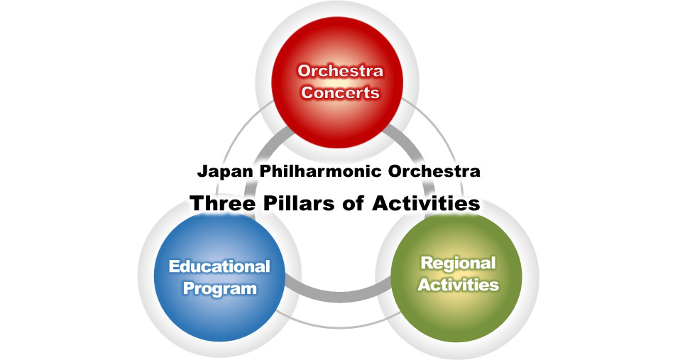 Japan Philharmonic Orchestra continuously tries to be a carrier for making a rich society by connecting people through music. "Orchestra Concerts", "Educational Program", "Regional Activities;" these are the three main important activities we focus on to create an awareness of culture through music. We broaden various types of concerts such as "school/institution visiting concerts" which take place more than 200 times yearly and "Family concerts" for children to feel orchestra music. All these concerts are exclusively performed for children who will be responsible for the future. We have also developed a workshop to nurture the creativity and cooperating personality through music in collaboration with an education program expert, Michael Spencer from the United Kingdom. Moreover, we are expanding many activities by developing workshops and programs for school music teachers. In addition to developing new platforms for the exposure of music to children, activities to develop communication skills through music is being widely noticed by employee training programs in various companies. 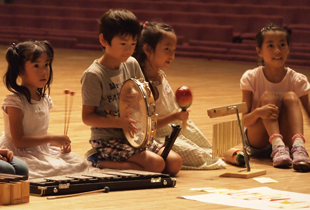 Japan Philharmonic Orchestra, cooperating with communities all over the country for many years, has successfully contributed to the development of culture and community through music. Concerts in Kyushu where the the orchestra performs in all prefectures in Kyushu region have been carried out since 1975. These performances are carried out with local volunteers from deciding the program to ticket sales. In addition, in 1994, the orchestra formed a friendship alliance with Suginami ward, Tokyo, and have developed a close relationship with activities such as "Suginami Koukaidou series" and "Music class for 60 years old." We also started orchestra performances as "Culture restoration to region business" in Ube city of Yamaguchi prefecture from 2008 in collaboration with three joint companies, corporation, government, and orchestra. 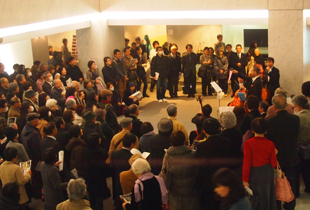 It has established as a new activity where the orchestra go forward with people in the community. 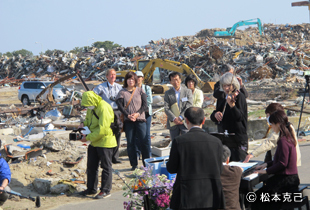 One month after the Earthquake in Tohoku region in March 2011, we started a volunteer activity of raising funds from the audience in the name of "Bring music to affected areas." We have held 208 performances in the areas as of December 2016. 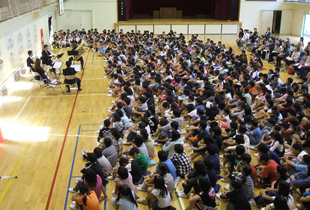 Japan Philharmonic Orchestra has summarized its activities in which they create the awareness of rich music as Forest. There are many different stages in a forest, and a forest is a source of river that nourishes the world. Through "Education program" and "Regional activities," we help connect the orchestra to people and the society and find new values and richness in life. We name these activities, "Music Forest."